If Frederick Scott is remembered at all today, it is as minor Victorian poet or as the father of his illustrious son F.R. Scott. However, Frederick Scott was almost 55 years old and the pastor of St. Matthews Anglican Church in Quebec City when he volunteered to go overseas to serve as senior chaplain with the 1st Canadian Infantry Division during the First World War. The depth of his faith was tested when he lost a son at the Battle of the Somme. 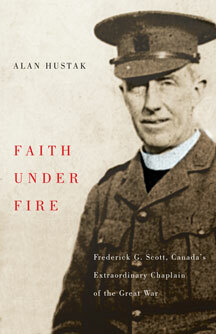 Through a series of unpublished letters in the McCord Museum, author Alan Hustak tells the powerful and absorbing story of a man revered by the Canadian military for his remarkable ministry. One admiring private recalled, “No matter how thick the fight, he is always to be seen wherever the boys are. … to see men dying all around you, all dying for principle, it hardens a man, and at the same times softens him.’ His letters home from the front reveals how Scott discovered first-hand what fear really is, how to conquer it and how to inspire others. Alan Hustak is the author of several books including Loughheed: A Biography, Titanic: The Canadian Story and Sir William Hingston (1829-1907): Montreal Mayor, Surgeon and Banker. He lives in Montreal. 188 pp 8.5" x 5.5"